Peace, love and leather hard pots. One of my favorite moments when I’m making pots is that moment in time when the clay has firmed up enough to handle without distortion. The moment when you can take a trimming tool to the bottom of the pot and you get nice long ribbons of trimmings that don’t gum up your tool. Normally, the moment in time when the pots are perfect for stamping, carving, slipping and trimming is a moment that I experience in solitude with my pots. But I thought that I would try to share a bit of this moment with you. Below are some images of cups that I made today. They are freshly stamped and awaiting a second trip to the wheel for trimming. You can see in the image (below) on the left that the soft clay is impressed deep enough that you can see the stamping on the inside of the cup. I hope that you can get a sense of the depth of the stamping from the image on the right from the pictures (click on them to see the image larger). The clay has to be dry enough that the stamp doesn’t stick to the clay, but soft enough to get a deep impression without cracking. More to come on this series in future posts! I know that I am not alone in my love of leather hard clay. 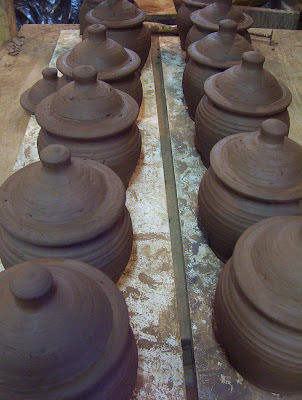 I see lots of freshly made pots in the posts of my fellow clay bloggers! I have put together some pictures (and links) from their sites to share with you. Does anyone else sometimes treasure the process more than the finished products? 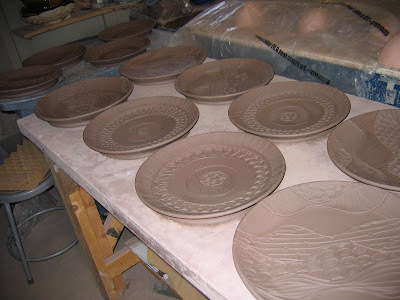 Amy Sanders, of Charlotte, North Carolina, shared this image on her blog of her carved plates. What beautiful lines! As usual, with pots, it’s all about the timing! I love how these drying beer cups from Euan Craig caught the sunlight in Mashiko, Japan. The perfect moment of leather hard met the perfect moment of sunlight streaming in his studio. Cheryl Alena Bartram of Golden, British Columbia, shares this great image of tumblers on her blog. I can imagine the board of cups going on and on and on and on…. I have been known to base the amount of pots that I throw in a sitting based on the length of a board or the size of the table. Douglas Fitch makes pots “in middle of nowhere, north of Exeter, Devon, United Kingdom,” far from my studio in Chicago. But when I see these images of the rough leather hard pots I think I can smell the mustiness of the clay… and that’s a great thing. I find that there is little more satisfying in a day’s work that a table covered in finished pots. 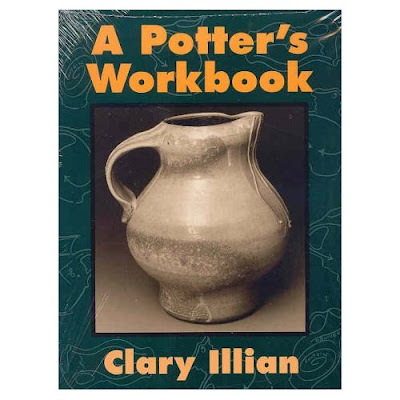 One of my favorite clay books is A Potter’s Workbook by Clary Illian. The images in the book are almost all photos of leather hard pots. The focus is on the forms without any distraction of decoration or firing technique. If you make functional pots, I highly recommend adding this book to your collection. This is an update (a long overdue update) to a previous post about clay blogs. When I first wrote about blogs that focused on ceramics, there weren’t too many out there. I am so happy to find this time around that there are a lot more now! I didn’t include ones that I listed before. And these are in no particular order. Enjoy- and please let me know if there are more out there for the next time around! A wonderful blog that I just discovered. (I don’t know how I’ve missed it all this time!) Great posts by Diana and guest bloggers. It’s been a lot of fun reading through the archives. A Potter’s Journal by Ron Philbeck. Great photos of Ron’s work in progress. I love the how-to posts as well as the studio updates. Jennifer writes about her day to day life in her studio, balancing her family life with her clay life. This is why blogs are great- you can share your personal experience in a way that you can’t through a book or a more formal publication. 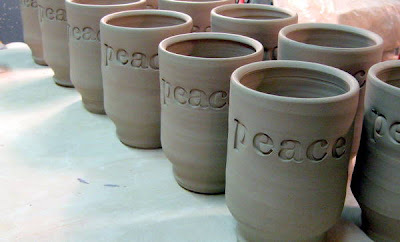 “Seeking to stretch ideas about peace, art, design, function, value, culture and making.” And lots of happy pots! A fairly new blog- but I think there will be some interesting things on the horizon, like her new Tool Talk series. Keep ’em coming! 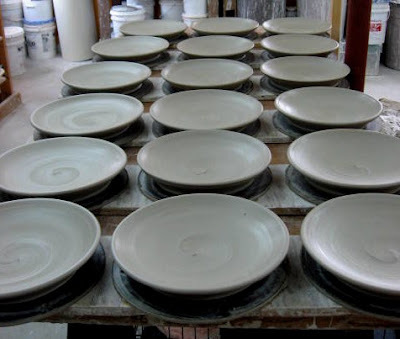 A weekly update for what’s going on at St. Earth Pottery in Fillmore, IN. I love reading about other potter’s work cycles. And I think one of my favorite parts is listing the music and podcasts of the week. Maker of “country pots.” When you see the beautiful photographs on his Douglas’ blog, you can see how the landscape effects his pots. Something that I think about a lot as an urban potter. A nice (and fairly new) blog that has a lot about the business side of pots, and some how-to’s and other studio updates. 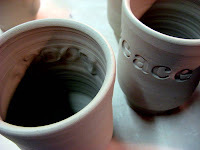 One thing that I really like this blog is that Gay writes abouts the ups and the downs of making pots! A new blog by a Lillstreeter (def: someone who works at Lillstreet Art Center in Chicago) which documents her thought process and her new ventures into selling her work. Keep it up Julie! Jeanette’s blog is hilarious! In addition to the humor she has some great info including documentation on her glaze testing, and reviews of books and videos. Taylor has great tutorials – directions on how to make things like plaster bats and terra sigillata. Great information illustrated with helpful photos. Most recent posts have been about Whitney’s residency in Japan. An unusual perspective and thoughtful posts. I love this blog! Karin’s work is beautiful and she has endless links to other makers and designers from around the world. This is a group submission site that is about all things handmade. A must visit often site! See this page to learn more. A great photo tutorial on pit firing. I’m also enjoying reading about Tara’s venture into Etsy. Well, I think that’s enough for now… I hope you have enjoyed this tour. I have thoroughly enjoyed researching this. I have discovered some really exciting new blogs to subscribe to!